Halloween is in the air and my neighborhood takes Halloween very seriously! Skeletons, zombies,ghosts and witches but also crazy orange blow up pumpkins are everywhere. Cobwebs coat front porches and shrubs. Not to mention the tombstones that have sprouted up on almost every lawn. This has made walks with Bodhi more lively, especially now that its dark when we take our evening walk. Bodhi is not quite sure what to make of it all and has had several close encounters with skeletons and black cats, of the plastic kind. The first few tombstones he saw required an extra sniff, but now they’re a good stand in for a tree! One of the neighborhood teens down the street puts up a haunted house each year and collects donations to the local food bank from visitors. He starts working on it months before and its fun to see this crazy elaborate haunted house take shape in his driveway every year. The kids love it and its become a local tradition. And this being low-key Berkeley, the decorations will stay up for a good long while even after fright night passes. No one seems to care that the ghost hanging from the tree looks a bit droopy and out of place come Valentine’s Day. 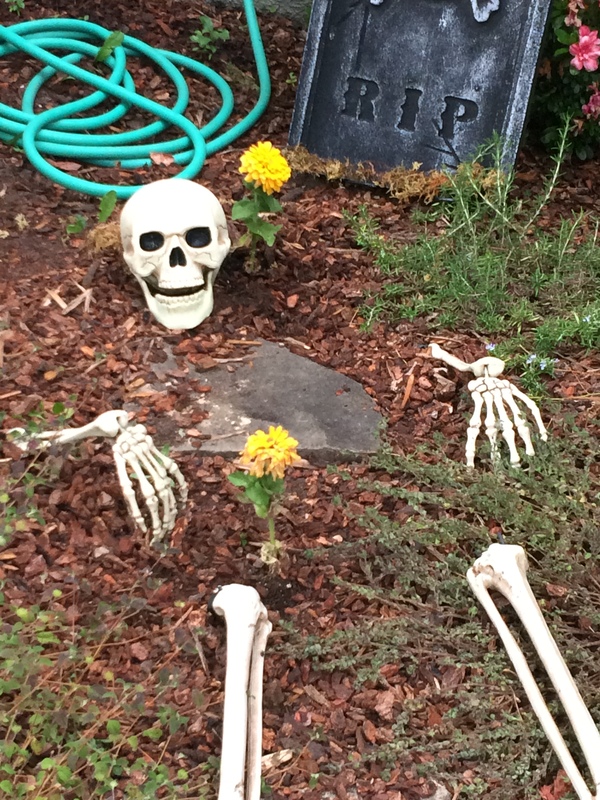 One of my neighbors lined their entrance path with skeleton head lights last year and when they were still up at Christmas, they gave each skeleton a green or red bow on top. Creative recycling at its best….only in Berkeley!